Dawn breaks and the sun’s first rays peep out above the horizon, but these aren’t the rays we’re here to catch. When most people think of rays, they picture stingrays and mantas gliding through clear tropical waters, not lurking just ten metres off a cold shingle beach in East Devon. But this where I found myself at seven o’clock this morning, sporting my new waders, four layers of clothing and a neon “traffic cone” oilskin jacket which promptly led to the local fishermen assigning me the nickname “Fluorescent Flo”. Today, I was aboard Charlie Ziemann’s beautiful boat, Sunbeam, collecting data on the local ray fishery in the Lyme Bay Fisheries and Conservation Reserve, BLUE’s flagship project in the UK. Here, mobile gear has been prohibited since the Reserve’s designation in 2008, allowing marine life to flourish and local artisanal fisheries to prosper from a greater abundance of commercial species. Recently, local fishermen have observed higher catch rates of ray, particularly thornback rays, within the Reserve. 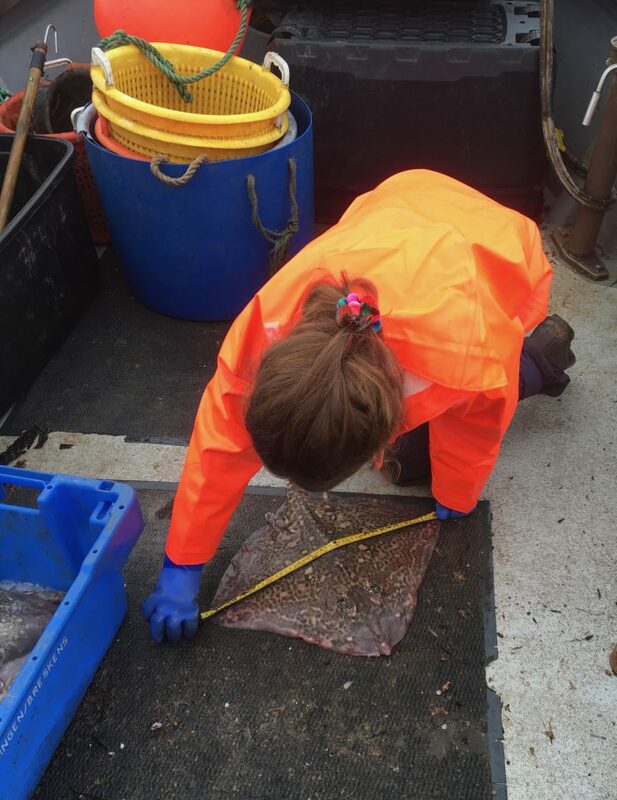 These observations are encouraging as thornback rays are currently classified as “near threatened” by the IUCN and rated level 5 – “fish to avoid” – on the Marine Conservation Society’s Good Fish Guide for the Lyme Bay area. However, like many small-scale fisheries, the lack of data on local stocks and capture methods has hindered fishermen’s ability to obtain distinct ratings for local fisheries. As such, these ratings do not take into account the sustainable fishing methods (mainly pots and nets) used by local fishermen within the Reserve. Fishermen like Charlie and his brother Gavin have, through their partnership with BLUE, created conservation measures to improve the sustainability of their fishery and reduce the risk of bycatch which is a major driver for the decline of rays in other areas. 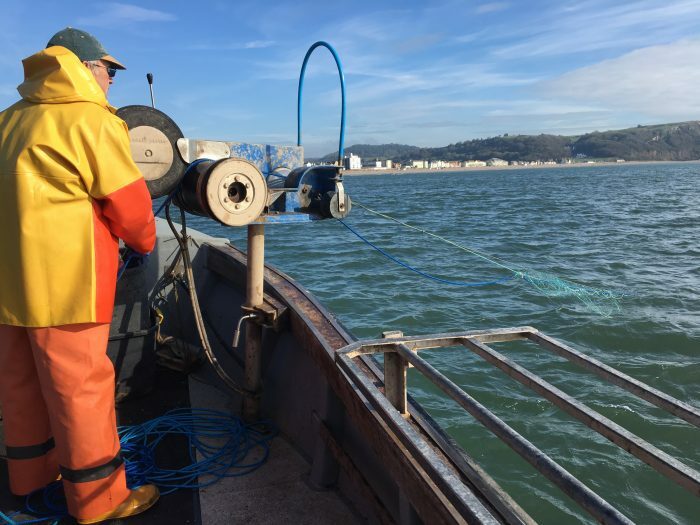 Thanks to the Lyme Bay Fisheries and Conservation Consultative Committee (facilitated by BLUE), fishermen are able to set these conservation measures with help from scientists and regulators, and have voiced their desire for more research to be carried out into the local ray population. 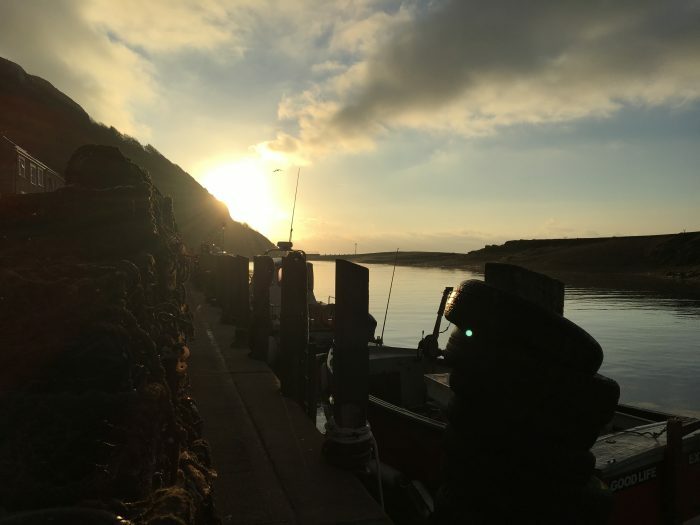 This kick-started BLUE’s Ray Project which will work with fishermen aboard their boats to assess the sustainability of the ray fishery by recording important data on capture methods, size and species of ray caught, number of discards and their spatial distribution within the Reserve. With high hopes and nets ready to be hauled, we squeezed through the narrow opening between the harbour wall and shingle beach to our first site. 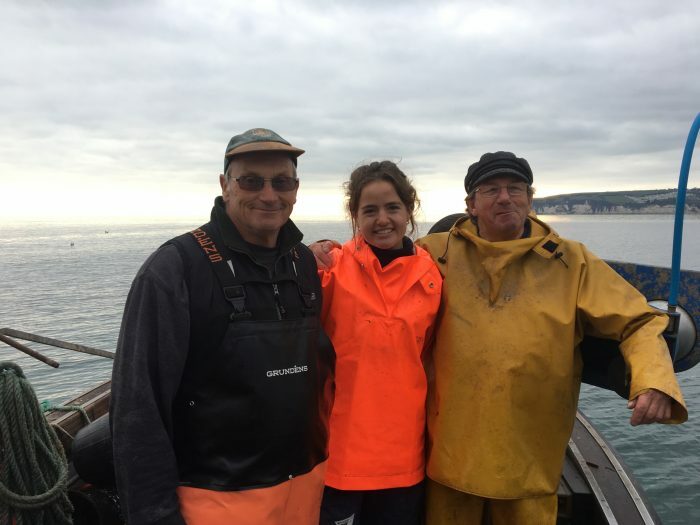 Brothers Charlie and Gavin Ziemann have been fishing out of Axmouth for the last 40 years and use their experience to target ray hotspots. 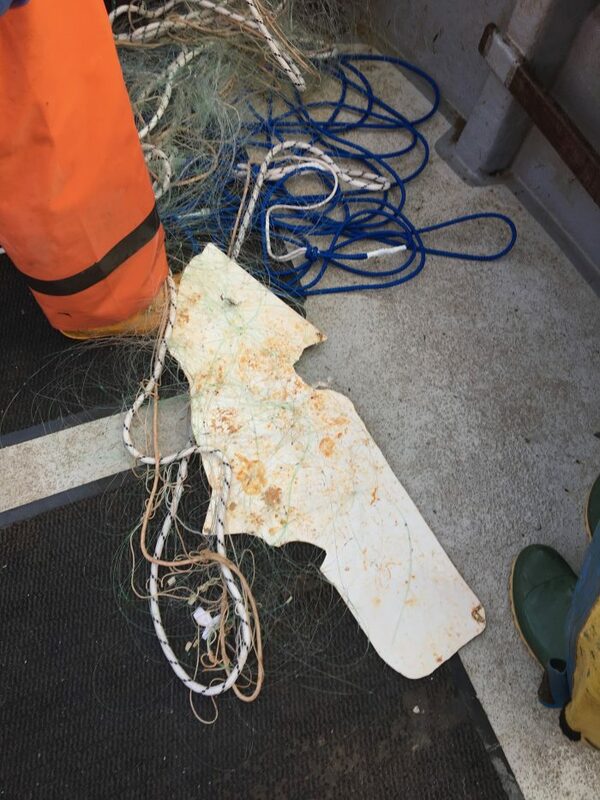 They had set their gear the previous day using specific ray nets with larger mesh sizes to allow juveniles and smaller fish to slip through unharmed. As we were hauling in the first net, a large white object gradually rose to the surface. Our excitement was short-lived as we soon realised it was just a huge sheet of plastic imitating the underside of a ray. However, a few yards later we caught our first ray! A beautiful undulate ray with detailed aboriginal markings measuring 77cm (nose to tail) which is just under the minimum landing size (this species is under a restricted management framework due to its near-threatened status in Europe.) This individual was promptly returned to the sea unharmed. Next up were two magnificent shagreen and thornback rays. Both individuals were above the minimum landing size (MLS) and therefore quickly put onto ice once recorded. MLS is one of the only management measures applied to skates and rays in the UK. 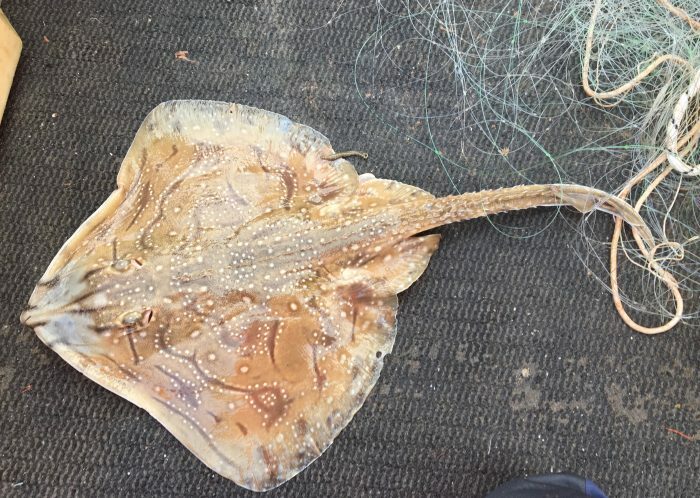 Currently, only three out of the ten regional regulatory authorities in England, called Inshore Fisheries and Conservation Authorities, enforce an MLS (between 40-45cm) which is measured from wing tip to wing tip, unlike undulate ray. One of the outcomes of this project will be to incorporate conservation measures, such as a MLS, into the Reserve’s Voluntary Code of Conduct which is currently signed and adhered to by 59 fishermen. The code, reviewed annually, commits fishermen to practice responsible and sustainable fishing methods, such as pot limits, and requires all vessels to carry iVMS systems to track their positions in the Reserve. We continued to haul in two more ray nets and I quickly developed a fast and efficient technique of untangling the rays. However, from time to time, one can become complacent and lose focus for just a second which is enough time for a small juvenile thornback to lunge at a big blue hand and bite very hard on your finger (adding to BLUE’s annual injury tally – coming soon)! As this ray was undersized, it was carefully returned to fight another day. 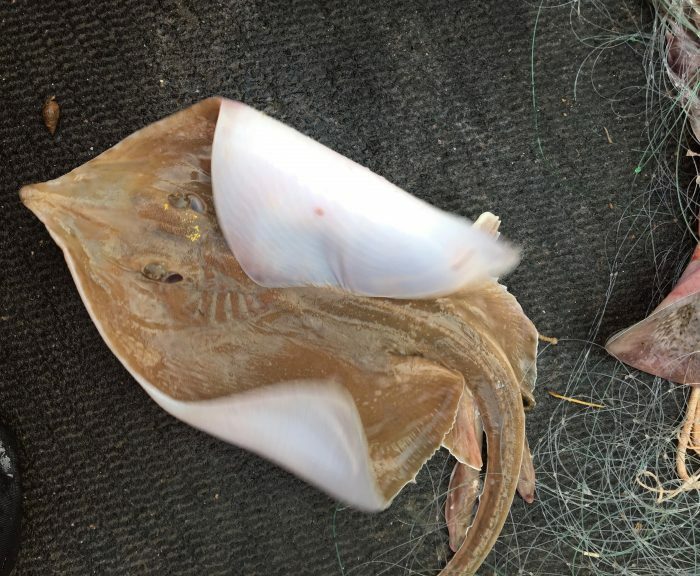 Luckily, the survival rate of discarded rays is very high (depending on handling methods) and can range between 85-95 per cent survival from inshore gillnets. This is highly beneficial for maintaining healthy populations as rays are very vulnerable to overfishing due to their aggregating behaviour and loyalty to certain areas which can increase their risk to local exploitation. Protection of these preferred habitats is crucial to conserve local ray stocks. Therefore, understanding the spatial distribution of rays in the Reserve is very important to implement appropriate management measures. We finished the morning with a large haul of thornback and small-eyed ray. Small-eyed ray are also managed under strict management and must be returned due to their depleting numbers along the coast. However, fishermen believe numbers are increasing with two recreational anglers catching 47 in one trip! Stories like this are very encouraging and we urge all fishermen targeting and catching rays within the Reserve to record their catches and send the information to BLUE.